Dr Fierke is also a Reader at Queen’s University Belfast and holds a chair in International Relations at the University of St. Andrews. The main argument of Critical Approaches to International Security is that security is always political. This is explored through an analysis of the emergence of Critical Security Studies since the end of the Cold War as well as the ‘expansionist’ debate and arguments that ‘security’ is an essentially contested concept. The book is structured around a range of concepts, including change, identity, danger, fear and trauma, human insecurity and emancipation, all of which are explored in relation to concrete security issues in a global context. -What does it mean to approach the study of security from a critical perspective? -How have the debates surrounding critical studies evolved over time? 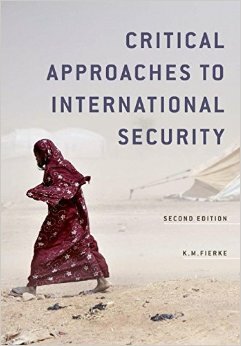 I have sought to answer these questions through an extended analysis and synthesis of the debates that have shaped critical security studies, which, within the book, are structured around key concepts, and tracing how these debates have changed since the inception of critical security studies in the 1990s. While the book has been used by many as a textbook, it does contain an argument that security is political, essentially contested and dependent on context for its meaning. While the early concern of critical security studies was the narrow military definition of security, which was a focus of the first edition, the second edition traces a shift in these debates with a greater focus on practices of global liberal governance. While the first edition highlighted claims that traditional security studies is ethnocentric, shaped by primarily American concerns in the context of the Cold War, the second edition adds the voices of those who have argued that Critical Security Studies is also ethnocentric and European. I conclude, against the backdrop of current global changes and emerging non-Western powers, that there is a need at this critical juncture for a more global conversation regarding the meaning of security and protection from harm. The first edition was very well received and is frequently cited within the larger CSS literature. The second edition tries to place CSS within an evolving context in order to address questions about the continuing relevance of a specifically ‘critical’ security studies, given some would argue that having become mainstream, particularly in Europe, it has run its course. My argument, in light of the evolution of CSS, comes back to one of its central themes, that is, that critical scholars are always positioned in historical space, and from there raise questions about the assumptions or contradictions of their context, as a point of departure for opening a space for change. Thus, while the world has changed, there is no endpoint to the critical endeavour, and the need for reflexivity about our assumptions, including theoretical assumptions. I began my professional life, prior to becoming an academic, in the context of the nuclear debates of the 1980s. Since becoming an academic, my own work has been less framed by critical security studies per se than social constructivist debates about questions of meaning, post-Wittgenstein, and tracing changes of meaning in use. While this has been a critical enterprise and related to questions of security, my positioning in relation to the broader literature explored in the book is less to identify with any one theoretical tradition, of which the Frankfurt School and Foucault figure prominently, but rather to trace the evolution of these debates and attempt to draw out what is at stake. Securitization, which is the focus on one chapter, has generated a huge literature and continues to do so, although at some point this is likely to run its course. The book touches on a number of other emerging issues that are at the cutting edge of research and debate, including emotions and security, ethics and security, quantum approaches to security or the engagement in a more global conversation that goes beyond the West.